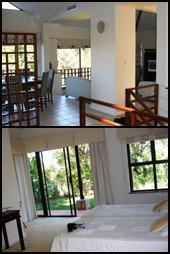 Overview: 4 Idlewild is a 4 bedroom house situated in the exclusive Zimbali coastal estate. The Zimbali nature and golfing estate fronts on 3 km of unspoilt beach. The Zimbali estate is home to an abundance of bird and animal life and hosts several natural springwater lakes along with a 50 hectare reserve demarcated as a conservation area. The estate facilities include the spectacular Tom Weiskopf designed 18 hole championship golf course, soon to be joined by the Gary Player designed 18 hole championship course.